We’ve all got that one friend that is ready for Christmas in July. The friend who at the end of August is already posting memes, informing you of exactly how many sleeps or how many weekends are left until the big day. I thought my sisters were going to lose their minds when Hallmark dropped their Christmas movie list and the names and synopsis of New movies coming this Holiday season. Don’t get me wrong. I love Christmas- everything about it and all of the traditions. Bring on all the bells & whistles! But I tend to wait until the day after Thanksgiving to get things going. It’s become a tradition in, and of, itself. Personally, I’m still pinning and working on Halloween ideas for myself and the kids. Professionally, I don’t have that luxury. Not that I’m really complaining, more like explaining. Explaining ‘what’ you may still be wondering? 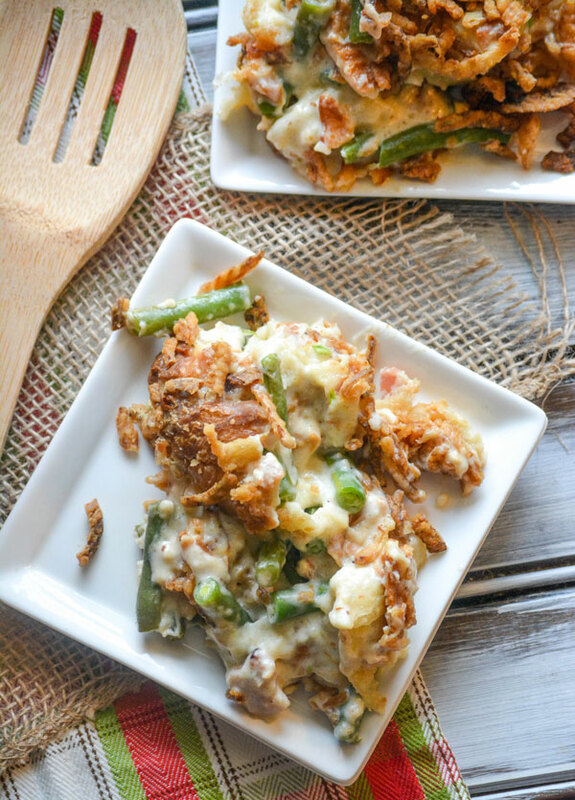 Today’s recipe for Green Bean Casserole Bread Pudding, well it’s me officially dipping my toes into the waters of ‘Holiday 2017’ posts. There’s not much to actually complain about when I get to fix, and enjoy, some seriously good, down home comfort food. Oh, and the desserts?! But I know sometimes people don’t want to even contemplate Thanksgiving or Christmas before Halloween. But if I waited until closer to the actual season to get started, my content wouldn’t have time to curate, make it’s way around the interwebs, and reach all of you lovely, hungry foodies in time to enjoy this year. 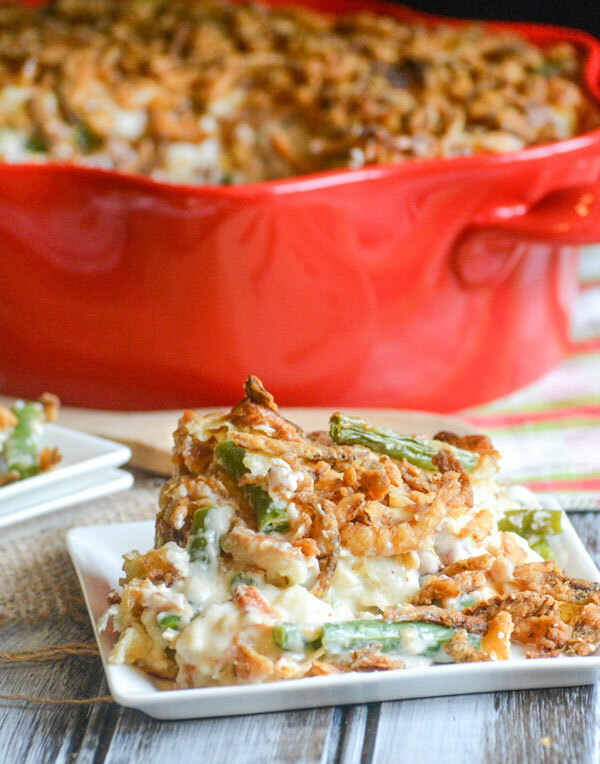 I gotta tell ya, this here Green Bean Casserole Bread Pudding is just too good to wait an entire extra year to discover. 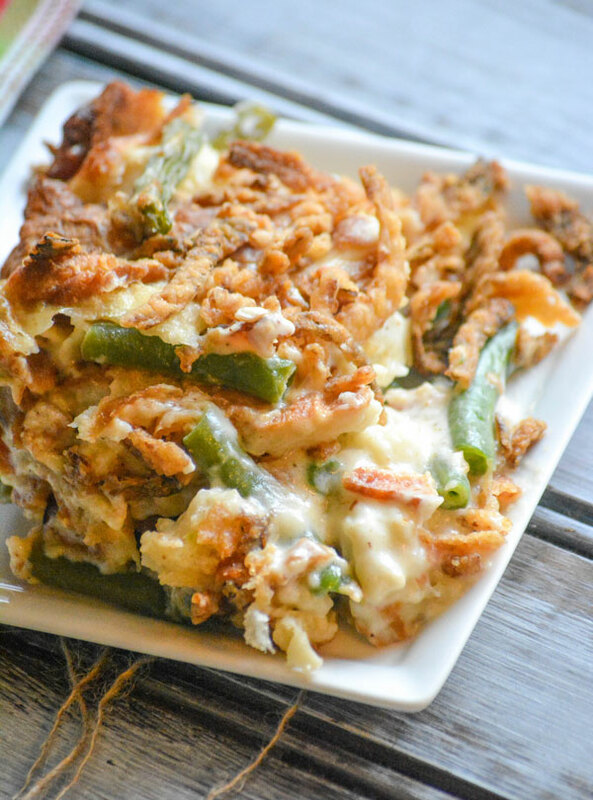 Green bean casserole is a holiday staple in many homes. 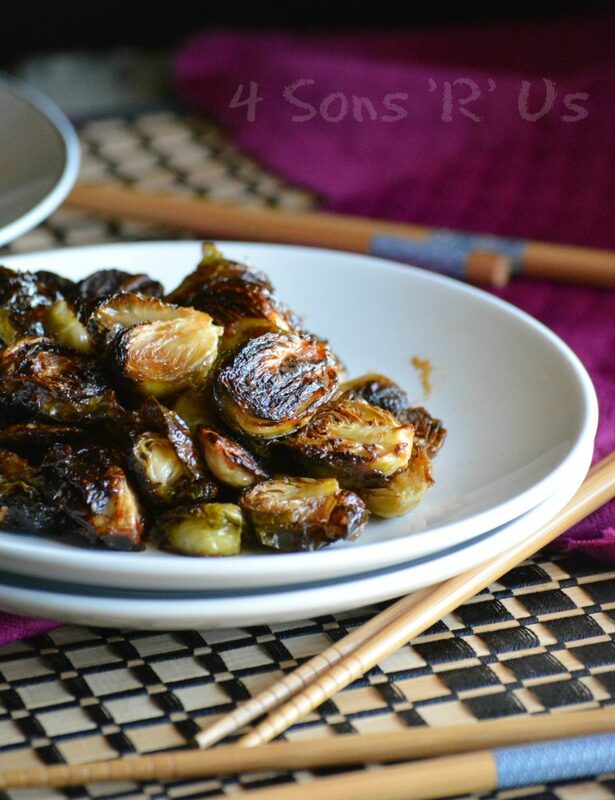 It wasn’t one of ours growing up but, since discovering it courtesy of my MIL’s menu, I can totally taste why! A creamy casserole featuring a beloved vegetable, it’s easy an quick to throw together with a lovely crunch on top. What’s not to love about that? Even better, whichever big meat you decide to serve- be it turkey or ham- it pairs perfectly. I decided to give my MIL’s vintage classic a new face lift for the Holidays this year. It’s 2017, it’s time. 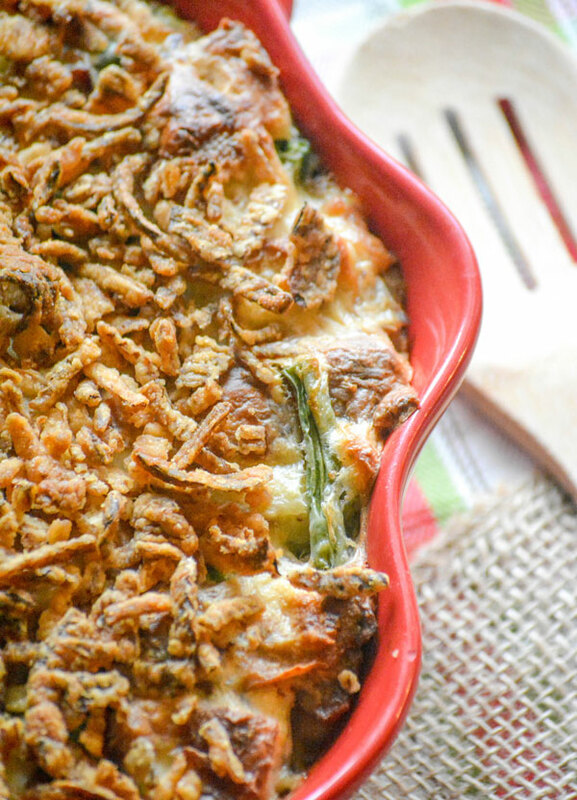 The result is a new edible tradition in this Green Bean Casserole Bread Pudding. 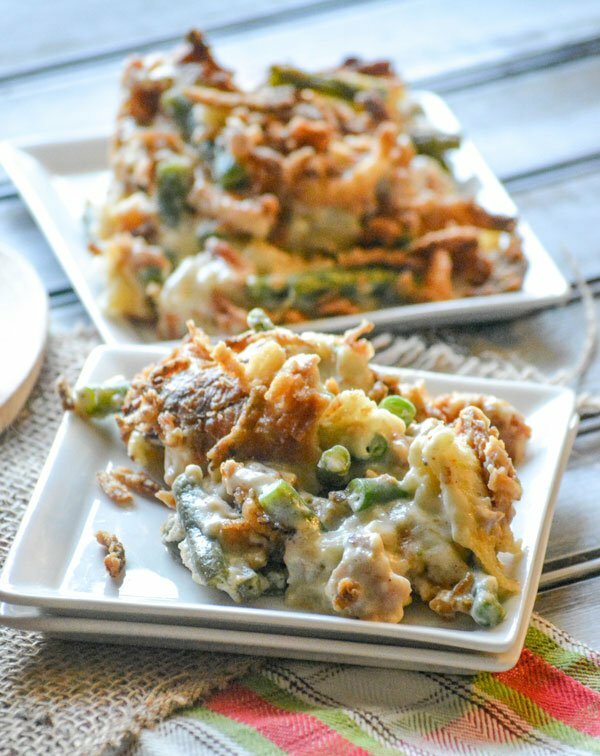 The flavors you love in the classic casserole, but baked into flaky buttery croissants with fresh green beans, crisp bacon, and a rich creamy cheese sauce. One bite, and even Scrooge himself would be getting in the holiday spirit! 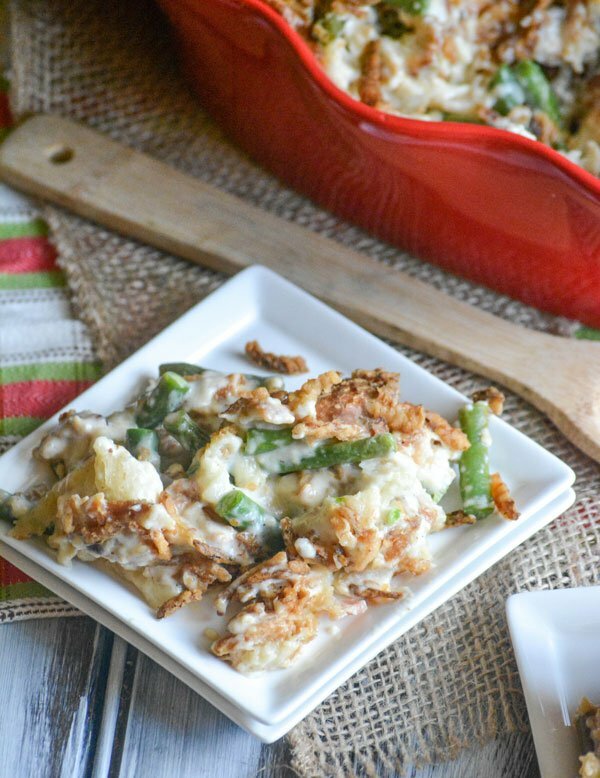 A fresh take on the classic side dish, this version takes a creamy green bean casserole and transforms it into a creamy, cheese bread pudding. In a large skillet, melt the butter over medium heat. Whisk in the flour, and cook while stirring for 1-2 minutes. Slowly add in the half and half, about 1/2 cup at a time, whisking until a roux has formed and it's completely smooth. Whisk in the seasonings, and let the mixture simmer for another 2 minutes- stirring occasionally, until the sauce has thickened some. 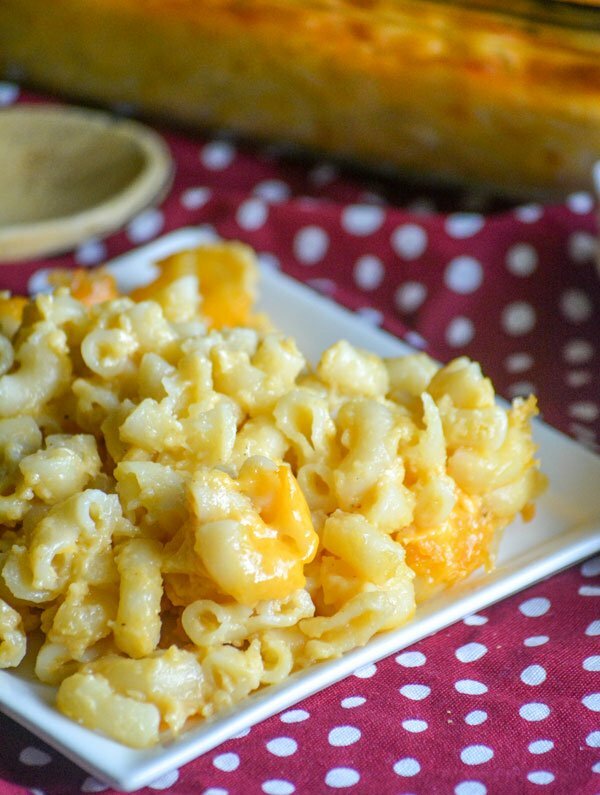 Remove the skillet from heat, and whisk in the cheese, stirring until completely melted and incorporated. Add the green beans, bacon, and croissants, and use a spatula to gently fold them in until incorporated. Lightly spray a 9x13 dish with non stick cooking spray. Transfer the casserole mixture into the dish. Use a spatula to spread it out evenly. Evenly top with the fried onions. Bake at 350 degrees for 30-35 minutes, or until golden brown and bubbly. Tent with foil and let the mixture rest for 5-10 minutes before serving, so that it 'sets'. It will still be warm and plenty creamy! 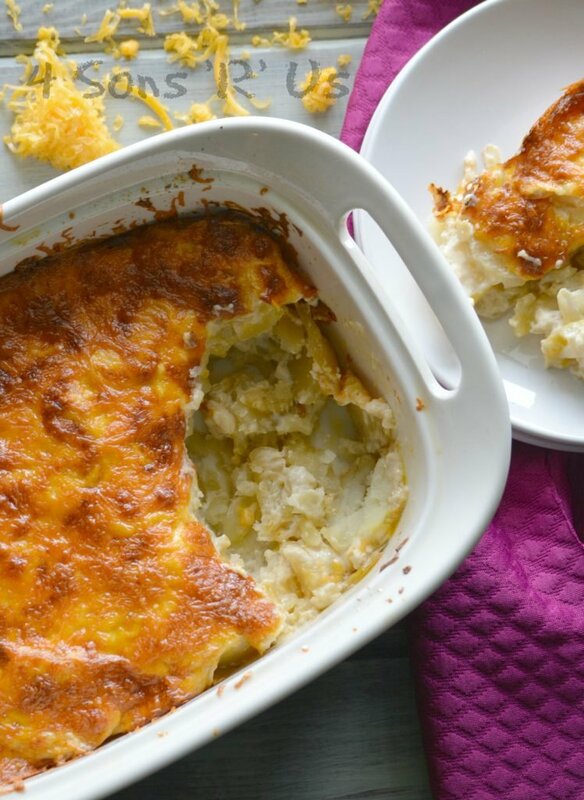 This sounds like a perfect casserole of comfort! 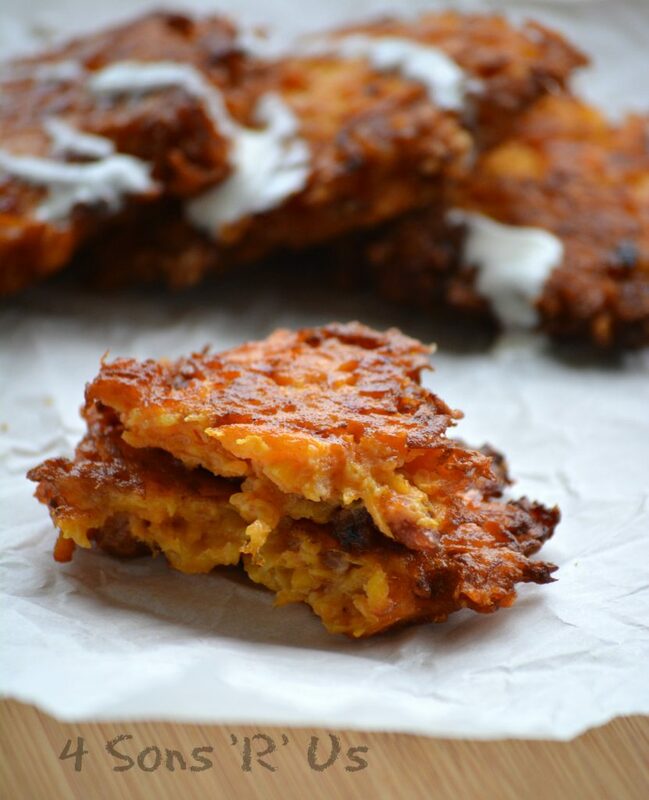 I will absolutely give it a go, and so perfect for sharing!